St. John Bosco Academy exists to support families in the endeavor of educating their children, but also to provide a community where families can share two common loves: love of the Catholic faith and love of family. The hybrid system of education emerges as an exceptional option for families by the serving the heart, the mind, and the home. At St. John Bosco Academy, we value parents as the first and most essential teachers of their children. Giovanni Melchior Bosco was born in 1815, the youngest child of a peasant farmer in north Italy. Raised by a holy mother after his father died when he was only 2, John Bosco's life was marked with mystery and faith from a very young age. He began having dreams at the age of 9 that would eventually show themselves to be messages from Our Lord to John. In his very first dream, the young Bosco dreamed that he was in a field with a crowd of cursing and misbehaving children. John jumped into the crowd to try to stop them by fighting and shouting. Suddenly a man with a face filled with light appeared dressed in a white flowing mantle. The man called John over and made him leader of the boys and said, "You will have to win these friends of yours not with blows but with gentleness and kindness." St. John Bosco's "Preventive System" of education is built upon the core ideas of reason, religion and kindness. He taught that, "Without confidence and love, there can be no true education." 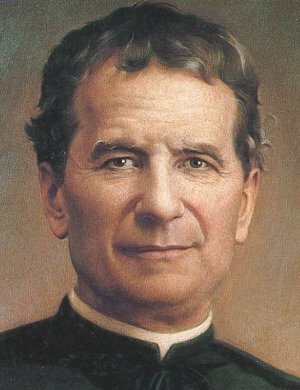 Through his work with boys who lived on the streets of Turin during Italy's industrial revolution, St. John Bosco's love for God was manifested in his love and concern for each of his charges. Applying is easy using our Online Application.